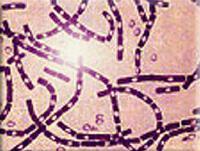 Anthrax is a bacterial disease that usually affects the skin, but may also involve the intestines. It is caused by bacteria called Bacillus anthracis that can infect all warm blooded animals including man. The disease is still commonly found in livestock (cattle, pigs, goats and sheep) in developing countries in Asia, Africa, and Central America. You can get anthrax by exposure to infected animals or contaminated animal products such as wool, animal hair, skin, and bones. Persons at highest risk of getting the disease are occupational workers who handle animal products, agricultural and wildlife workers, and veterinarians who handle infected animals. Transmission usually occurs during the processing of animal products, either by direct contact with the contaminated raw material or by indirect contact with a contaminated environment. The bacteria are resistant to drying and disinfection, and can remain alive in contaminated soil for years after the death of the animal. Although rare, you can also get anthrax by breathing in the bacteria. Person-to-person spread is not thought to occur. The symptoms are different depending upon the way a person gets the disease. When a person gets it by way of the skin, itching of the skin surface occurs first. Then, a boil-like sore appears, which subsequently forms a depressed black scab surrounded by moderate amounts of swelling. When left untreated, the infection can spread to the regional lymph nodes and eventually, into the bloodstream. If a person breathes in the bacteria, the symptoms may resemble a common cold, which can progress to serious breathing problems and even death. Most individuals experience symptoms within 48 hours following exposure to the bacteria, but the onset can range from 2 to 7 days. Your doctor can prescribe drugs for anthrax. If not promptly treated, a person can die of the disease. A vaccine is available for high-risk persons who routinely handle potentially contaminated animals and animal products. How can you keep from getting it? Immunize persons who have jobs that expose them to the bacteria. Use extreme caution when handling dead animals that may be infected with anthrax. Have good air circulation when working with animal hides, fur, hair, or wool. Vaccinate animals that may be at risk. As I stated in my initial posting regarding this, patriotic Americans every-where must take this threat seriously, even if it does not materialize. I believe the American public in general, and the patriot/militia movement specifically, has been woefully unprepared for the type of biological attack contemplated here. Let us take this opportunity to exercise our capabilities to prepare quickly and to communicate. Also, let us be sure to add to our personal storage and preparedness plans, the necessary ingredients for such conditions, such that we may, with the help of God in Heaven, rise up after any such event and resist and overcome the tyranny that is sure to be implemented in conjunction with such an event. 1) Certain antibiotics have been tested and shown to be effective against anthrax and bubonic and/or pneumonic plague (which are the agents expected to be used in this event). Some of these are available in animal grade without a prescription from vets, or vet supply warehouses. The ones which supposedly are most effective include Doxycycline, Tetracycline, Teramycine, Penicillin. 2) Collodial Silver will work according to the people I have talked to, but requires fairly large doses (an adult should drink between 3 and 4 ounces per day of a concentration of 100 ppm) which means you would need a generator to afford it. I am including two documents, the first speaks to the anti-bodies and their dosages, the second speaks to making your own collodial silver generator (WARNING: Be careful with the collodial silver generator. Pure silver and distilled water MUST be used. Sterling silver or chlorinated water could be harmful. Good luck, keep the faith, and God grant that we may avoid such a horrific event by repenting as a nation and as a people and turning to God with all the energies of our hearts. If we can not avoid it, God grant that we my be strong, brave and true to Him and the principles of God granted liberty in getting through the crisis. We will have His help. In medical language, a prophylaxis is a preventative; or a prevention against a disease. As reported in an earlier article by Medical Corps we stated that there was no known prophylaxis against Anthrax. We now know of one. In point of fact, experimental treatment data indicates that daily doses of simple antibiotics -- even taken 24 hours AFTER exposure --will shield a human from contracting Anthrax. Not only do the antibiotics protect against Anthrax, but existing studies strongly suggest that the same prophylaxis will work against Cholera and Plague. Not long after the first Anthrax article was printed, Medical Corps received a call from a lady who said that the U.S. Army had done studies using antibiotics as a prophylaxis against Anthrax. The Corps agreed that this might work, but without verification, could not print it. About a month later a copy of a report from the Journal of Infectious Diseases arrived. Unfortunately, two pages were missing-- still not verified. Next stop was a VA Medical Research Center where this writer sifted through several volumes of the 50 or so Infectious Disease Journals in the VA Medical Library. We now have that document intact. Several things about this study are readily apparent. The antibiotics worked surprisingly well even when treatment was started a day after exposure. Given a day after exposure, the vaccine was a dismal failure. Without the prophylaxis, the chances of contracting the disease after being exposed to Inhalation Anthrax is almost a certainty. The study was done on monkeys. While the Rhesus monkey responds to diseases and medications quite like a human, they are still animals. Human dosages will be different and the outcome may be better or not as successful. a. If you contract Pulmonary Anthrax and you do not treat it, YOU WILL SURELY DIE! b. Even with the most heroic treatment measures available in a hospital setting, your chances of surviving Pulmonary Anthrax are extremely remote. c. Human doses are determined by conversion calculations between animals and humans. This is accomplished through blood level comparisons of MICs (Minimum Inhibitory Concentrations), dosage weight tables, peak and trough levels as well as various case studies. d. Additionally, human dosages were discussed with Pharmacists, Physicians, Clinicians and a former Chief of Medical Research of Oklahoma. What all of the above means is that the dosages will work and are as accurate as possible without human studies. 1) Minimum adult dosage for Doxycycline - 200 mg every twelve hours (BID/q12h) x 45 days. 2) Maximum adult dosage for Doxycycline - 150 mg to 200 mg every eight hours (TID/q8h) x 60 days. Note: When our survival depends upon antibiotics we tend to think that if this much is supposed to work then two or three times as much will be even better. Antibiotics are alien to the human body and in prescribed dosages are only mildly poisonous. Taken in extreme doses they will damage your body or quite likely kill you. Dosages for children vary according to body weight and the drug being used. The Physicians Desk Reference (the PDR is a drug data book) states that for children above 100 pounds, the adult dose of Doxycycline should be used. For instance, a 60 lb. child would receive 60mg in two 30mg doses. However, Doxycycline tablets or capsules only come in 50 and 100mg sizes. Considering the insidious nature of Anthrax, it would probably be better to give the 60 lb. child a 25mg (1/2 of a 50mg tablet) dose every 8 hours (TID) for a daily total of 75mg of Doxycycline. Note: A dose rate of q8h (every 8 hours) keeps the blood level of Doxycycline more constant within an adult or childs system. A 40, 30, or 70 etc. pound child will require SEPARATE Doxycycline dosage computations using the formula 1mg per pound body weight. Then you will have to divide the dose into at least two or three equal parts and space evenly over one 24 hour day. 2) Tetracyclines kill the normal/essential bacteria responsible for a healthy body. Among other things, this can cause ulcers of the mouth and diarrhea. 4) Never use Penicillin and Tetracycline together. They tend to cancel each other out. 5) Sunburn -- All Tetracyclines will make human skin extremely susceptible to sunburn. As with all medication warnings, they must be weighed against the nature of the disease. Pulmonary Anthrax will kill you. Yellow teeth won't, and diarrhea can be dealt with. Tetracycline or Achromycin V were not used in the Prophylaxis study done by the U.S. Army! Conclusions that Tetracycline can be used as a prophylaxis were drawn from PDR dosages and the fact that Tetracycline is used to treat Cutaneous Anthrax (on the skin) before it enters the body's system. The drug of choice is DOXYCYCLINE! However . .. if you do not have Doxycycline and have access to Tetracycline, they are of the same class of antibiotics. They just have different dosages. Note: Adult dosages of Tetracycline are given to anyone over eight (8) years of age. Dosages for children vary according to body weight and the drug being used. The Physicians Desk Reference (drug data book) states that for children 8 years and older, the adult dose of Tetracycline should be used. For children 8 years and younger, a daily dose of Tetracycline equaling 10 to 20mg per 1 pound of body weight should be divided into four equal doses and given 6 hours apart for 45 to 60 days. Note: There is no existing data on a prophylaxis dose of Tetracycline for either children or adults. A daily dose of 15mg per pound body weight divided into four equal doses might be more in order. For instance, a 60 lb. child taking 15mg per pound would compute to 900mg in four equal doses. This would round to 1000mg and stay within the 10 to 20mg dose range. Since Tetracycline capsules only come in 250mg and 500mg sizes, the 60 lb. child could receive a 250mg dose every 4 hours. A dose rate may be varied an hour or so either way so as to make the total daily dose fit within a 24 hour period. Too, the total daily dose of Tetracycline may be rounded up 10% or so, as to accommodate a workable dosage. Note: A 40, 30, or 70 etc. pound child will require SEPARATE Tetracycline dosage computations using the formula 10 to 20mg per pound body weight. Then you will have to divide the dose into at least four (4) equal parts and space evenly over one 24 hour day. 1) Tetracycline class antibiotics will cause yellowing of the teeth in unborn babies, infants and children to the age of 8 years (source -- PDR). 2) All Tetracyclines kill the normal/essential bacteria responsible for a healthy body. 3) If an allergy to any of the Tetracyclines develops or exists, discontinue and switch to a Penicillin class antibiotic. 4) Never use Penicillin and Tetracycline together.They tend to cancel each other out. 5) Sunburn-- All Tetracyclines will make human skin extremely susceptible to sunlight. 6) Tetracycline and milk should not be taken together or within one (1) hour of each other. Milk and Tetracycline combine in the stomach and pass out of the body without the Tetracycline being used. Remember, Pulmonary Anthrax will kill you. These drugs are not the same as those used in hospitals!!! While animal grade Tetracycline is the same as Human grade Tetracycline -- the animal has a different volume due to the filler. However, you do not need grinders and bullet scales to arrive at a safe oral dosage. Look at the package. If it says 200mg of Tetracycline per teaspoon, and you need to take 500mg, then 2 1/2 teaspoons computes to 500mg. If the bag says 1000mg per tsp, then you take 1/2 tsp. for the same 500mg. Read the bag! If you cannot figure out the dosage from the information on the bag, check a different brand. If the dosage is in grams, remember that it takes 1000mg to make one gram. If the instructions are in milligrams per gram of powder find another bag--unless you just like to weigh things. DO NOT USE injectable animal antibiotics! They do not usually contain Lidocaine (a local pain killer), which means you will suffer greatly from just one shot. Add to that pain the increased volume of the animal shot and you might prefer death. THEY ARE NOT THE SAME AS HUMAN INJECTABLES! The epidemic curve for anthrax by days after exposure was assumed to be 1 day, 0% of cases; 1 day, 5%; 2 days, 20%; 3 days, 35%; 4 days, 20%; 5 days, 10%; 6 days, 5%; and 7 or more days, 5% (3-5). Case-fatality rates were also assumed to vary by the day symptoms were first noted. The case-fatality rate was estimated as 85% for patients with symptoms on day 1; 80% for patients with symptoms on day 2; 70% for those with symptoms on day 3; 50% for those with symptoms on days 4, 5, and 6; and 70% for those with symptoms on and after day 7. The increased death rate in persons with an incubation period of 7 or more days is calculated on an assumption of delayed diagnosis, with resultant delayed therapy. When estimating days in hospital and outpatient visits due to infection, we assumed that 95% of anthrax patients were hospitalized, with a mean stay of 7 days. Patients not admitted to a hospital had an average of seven outpatient visits, and surviving hospitalized patients had two outpatient visits after discharge from the hospital. Persons who received only outpatient care were treated for 28 days with either oral ciprofloxacin or doxycycline. I read the Bio attack info. I was already familiar with the jist of it. You might like to let people know how they can make their own Colloidal Silver for the price of water.... Full instructions can be found in the Nov/Dec & May/June 95 issues of Perceptions Magazine (310) 313-5185. Here it is in a nutshell: Take 3 9v transistor radio batteries and wire them together (Radio Shack has the connectors for those batteries) in series so that they supply 27v (30 is ideal but 27 works fine). At both ends attach (solder) 'long' leads with alligator clips (Radio Shack again) attached to the ends of the leads. Purchase PURE (.9999 fine) 14 gauge silver wire -sterling WILL NOT work (1-800-759-9997 is a source by the ounce). Oh, sterling silver will make colloidal silver, but it'll poison the drinker due to the alloy metal that's added, so don't. You need 10 inches per generator. An ounce is approx. 55". OK, that's the generator. Cut the wire to 2 5"lengths. Shape them into the classic biblical shepherds hook. The hook end itself needs to be just large enough to catch the edge of the container you use to actually make the colloidal silver. Be sure to add a small tail to the hooks to connect the alligator clips. Shape isn't absolutely critical; it just needs to catch the lip of the container and allow some extra for the clips. Leave the rest of the wire straight. Purchase some distilled water. You want real distilled water, that is, from the distillation process, not merely filtered or something else. To make electrolyte: Take 6 ounces distilled water, and add 1 tsp NaCl (table salt, the purer the better). Agitate to dissolve. Store in a bottle with an eyedropper cap or use a separate eyedropper. This electrolyte will be used sparingly if at all. Oxygen processing) to 1 celled animals (viruses, bacteria, rickettasea (sp? ), fungus) GOD knows what else. I figure between the wife, the dog, and myself we consume a few hundred dollars worth of (if purchased) colloidal silver a week. Colloidal silver can be used anyplace you can use water, topically, internally (anywhere), injected (if suitably prepared- I don't- there's no need), in the eyes, ears, body orifices, well you get the idea. It can be stored in the DARK, in glass for approx a month so I'm told. I always make and drink fresh. Why screw around? The electrodes last for years. The batteries appear to be good for about a year. I have a wonderful pure water source and don't use any electrolyte at all. I recommend people use distilled water. Excess Chlorine in the water should be shunned. It will produce Silver Chloride (I assume it's poisonous-I was warned and I warn others). That's why we use minimal electrolyte. Locally we've had great results against (you'll find some of this hard to believe, but I swear it's true!) allergies (hay fever), ulcers (h. Palori (sp? ), flu, yeast infections, Gulf War Syndrome, Hot Spots (canine), Pink Eye (human and cat), and I can't remember all the successes. People that take the stuff just stop getting sick. So we don't know what all it is effective against. Supposedly works fine against Anthrax. The Perceptions directions add a battery to the series circuit, but that just lowers the voltage to the electrode and you need all you can get, so I leave it out. Oh, the guys that market the 'yellow' colloidal silver will tell you there's is superior. It is to them, they sell it. You can make yellow CS by not adding any electrolyte and waiting an hour (so I'm told). Ours works fine. Readers living in large cities, or near strategic military targets, might want to acquire antibiotics as used above as soon as possible. This will require the help of a doctor who understands your concern. In farm country, you can buy Tetracycline from a farm supply store that is for animals. It is quite safe, but do the weight to dose math problem carefully to get the right dose. These antibiotics are not dangerous if used as indicated above, and they have a good shelf life in spite of the dates on the package. Doctors in the tropics and in hospital use in the USA will double dose the first dose of most antibiotics. Tolerance due to repeated use of antibiotics is not nearly as much of a problem as we have been told. I have taken Tetracycline about 12 times for Amoebic Dysentery while living in Africa, and it worked the last time just as well as the first. If you live within driving distance of the Mexican border, you may drive across and get the drugs with a prescription written by the Mexican doctor running the pharmacy. There is an urgent need for help in getting these drugs. The Federal Government will not allow citizens to self-drug themselves, so by the time an Anthrax or Plague attack is known, it will be too late to save your life. This is a do-it-yourself emergency. Law is not as high a priority as taking care of your family and friends. Cure of choice if you have no opportunity to follow the details above- Tetracycline-- Double the first two day's doses and then follow normal dosing. 600 mg a day on empty stomach circa two hours after a meal. Exception is Doxyciline and Minocycline which can be taken with food. 40 pills of 500 to 600 mg each should be taken over a maximum of a 10 day period. The Dr. in Mexico suggested 500 mg every 6 to 8 hours. You may also buy CIPRO and other antibiotics in Mexico if you are near the border. You will need a prescription to come back into the USA with the drugs, but you can get that in Mexico. It is accepted by US Immigration for now. If you have a doctor friend who will help, tell him you think you have dysentery and want to treat it empirically. He has to have something based on your health needs which he must write in his records. Tetracycline is also used to treat acne. Go figure. After the Keystone Cops bungled their investigation, and after driving a man to kill himself, the killer is still out there. Thus, you need to make preparations because you are on your own. Watch The Anthrax Files on PBS. See more from FRONTLINE.